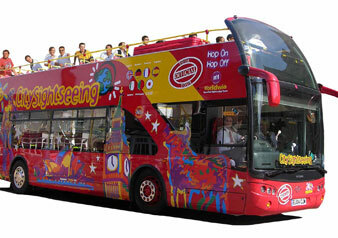 This Hop-on Hop-off bus tour of the beautiful Georian city of Bath, allows you to board the bus at any of the 36 stops. The bath tour has two different loops, one called the City loop and the other called the Skyline loop. Some of the main points of interest on the tour include Brock Street where you will visit the Royal Cresent. Stop number 17 of the City Loop is Terrace Walk, this is the nearest stop to visit the world famour Roman Baths, which opened in 1897. The Skyline Tour that takes you from Bath Railway Station (stop number 1) via the Abbey (stop 19), and on to the University of Bath and the nearby American Museum then around the beautiful Claverton Downs with some amazing views of the city to Prior Park Landscape Garden. Pre-recorded Spanish, French, Italian, Russian, German, Japanese, Polish, Cantonese, Mandarin and English.